Instantly eliminate thick, rough skin to reveal beautifully soft feet with this Probelle® 2-in-1 Nickel Callus Remover Foot File. This nickel callus remover is designed specifically for rough skin and calluses that build up on feet. The hypoallergenic foot scraper safely and effectively reduces calluses and corns to powder without any damage to healthy skin. Use the callus shaver on dry skin only. For maximum softness, apply a moisturizer or foot cream after use. 2 sides, medium and coarse. 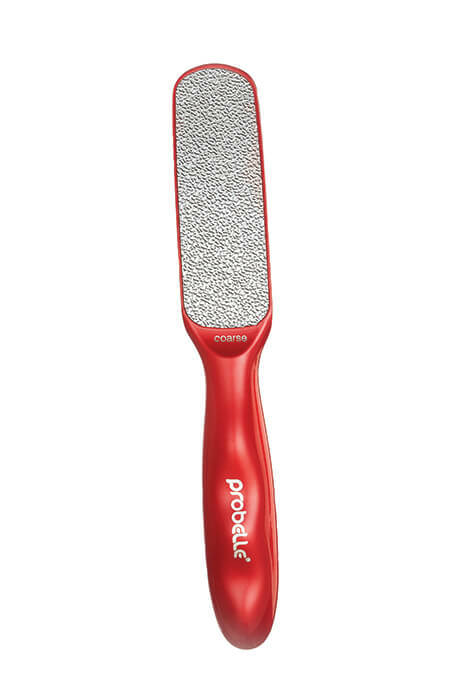 The Probelle foot file is easy to clean and sanitize. To use, file gently with back and forth strokes until dead skin is removed. File your foot gently with back and forth strokes until all calluses or dead skin are removed. Use only on dry skin condition. Calluses and corns will be reduced to powder without any damage to your healthy skin. Apply a moisturizer or foot cream after use to enjoy a softer feeling. I expect this item to be effective.